Ilayathalapathy Vijay starrer Theri was released on April 14 2016. The film started on a thunderous note at the Box Office is still breaking records almost everywhere. Have a look at the records set and broken by Atlee's Theri. 1. Theri has broken Thala Ajith'sVedalam opening day record of Rs 23 crore by a huge margin of Rs 6 crore. On it's opening day Theri has collected Rs 29 crores which now stands at the seventh spot in the list of all-time highest South Indian openers after Bahubali, Sardar Gabbar Singh, Lingaa, I, Srimanthudu and Endhiran. 3. Theri has collected a massive Rs 3.30 crore on its opening day to become the highest opener​ ever for a film in Kerala. The previous record was held by Shankar - Vikram's I with Rs 3.05 crore. 4. Theri recorded the highest opening weekend ever with collections of Rs 9.85 crore. On Monday afternoon itself the film had crossed the coveted Rs 10 crore mark at the Kerala Box Office. 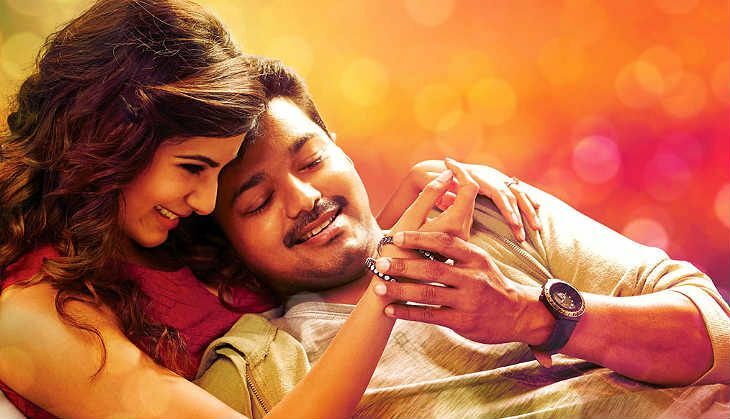 The Ilayathalapthy starrer easily surpassed the lifetime business of his previous blockbusters Thuppakki and Kaththi ( both Rs 10 crore plus grossers)​ in just five days. 5. Theri is the fastest ever Tamil film to cross the Rs 100 crore mark worldwide. Theri crossed the century mark in just 6 days time by beating Ajith's Vedalam record of 8 days. 6. With Theri, Vijay has equalled megastar Rajinikanth's record (three Rs 100 crore films) of the maximum number of Rs 100 crore films in Tamil cinema. 7. Theri has collected a massive £360964 (Rs 3.47 crore) at UK Box Office overtaking Superstar Rajinikanth's 6 year unbeaten record, £277,918 (Rs 2.67 crore) set by Enthiran. 8. In Canada, Theri has so far collected $329,084 (Rs 2.19 crore) from 1 week of it's theatrical release. The Vijay starrer is all set to cross the highest grosser, Enthiran's record of $499,831 (Rs.3.33 crore). Looks like Vijay is the new king of overseas Box Office.